Established in 1991 and now celebrating our 24th year in business! We began as probably the smallest rubber stamp store in existence! Our 1st store was in Fairhaven and was a total of 9 feet by 16 feet! How small was it? Well to put it into perspective our original store in now a functioning elevator! At present we are now one of the largest papercafting stores on the west coast and are still growing! We started moving into our current location on Christmas Day 2008 and opened for business on New Years Day 2009. We pride ourselves on true CUSTOMER service! Maybe that's why our customers regularly drive over 2 hours to visit us! 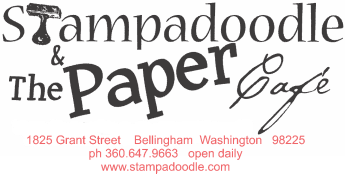 Stampadoodle is staffed by Wendy and Steve and a very talented team of artists: Marilyn, Lydia, Elli, Denise and occasionally Suzie & Christy. We are located in beautiful Bellingham, Washington between Puget Sound and majestic Mount Baker. Our customers come to visit from all over the Northwest. We supply local businesses with all their paper needs plus cardmakers, scrapbookers, bookbinders calligraphers and crafters of all kinds. Please plan on stopping by, we are open every day of the year with the exception of Thanksgiving and Christmas. I've been sewing since I was 4 years old and made my first quilt more than 40 years ago. Fabric arts are in my soul. My daughter got me started in paper crafts when she invited me to make Christmas cards with her almost 10 years ago. I had no clue that one rubber stamp purchase would lead to this! Elli is a creative soul in many aspects of her life. using many of the materials offered in our store. “Some of my fondest memories from childhood are of crafting with my family. From basket weaving and woodworking to sewing and paper crafting, I was never without opportunity or inspiration to create.